So, you have a wide variety of content and your website is leveraging those resources in the form of guides, ebooks, whitepapers, webinars and more. You understand the value of having an optimized landing page for each resource and are seeing great conversion rates...but why stop there? The most common “missed opportunity” for many websites is failing to implement Thank You Pages (TYP) for existing content resources. 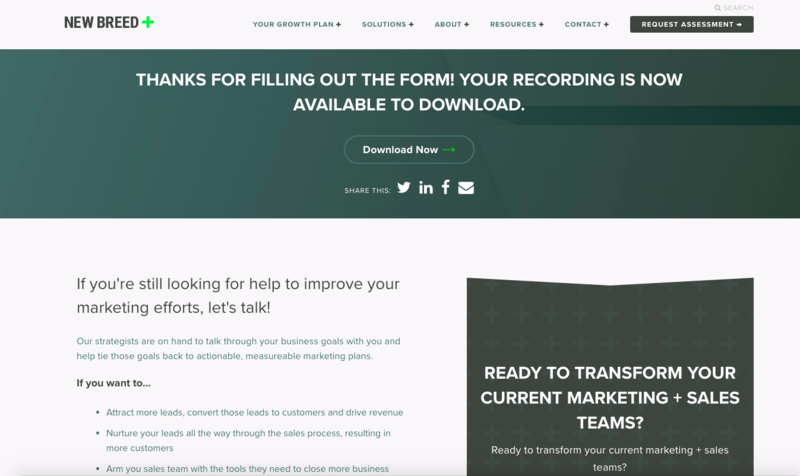 Thank you pages are “quick wins”— in other words, creating an optimized thank you pages is easy and painless, but it can significantly improve the effectiveness of your lead nurturing strategy. What is a thank you page and what value do they provide? A thank you page is the site page that a visitor is redirected to after filling out the optimized form on a landing page. Unlike inline thank you messages that leave visitors stranded, thank you pages keep the user engaged by telling them what to expect and/or do next. A Thank You Page is not only a polite way of treating your visitor after converting on an offer, it's also a great conversion tool. It provides another means of engaging users with relevant content to seamlessly continue their customized buyer's’ journey. So what makes a good thank you page? Include both a link to the content downloaded and a notice that an email with the promised resource was sent to the recipient's address. This is important because it will allow your visitor to access their resource right away by clicking the link and/or access it later by checking their inbox. Create more than one way to help your visitor reach the content they downloaded. Think about the buyer's journey. Having a bottom of funnel offer, such as a “contact us” form, may feel too early for visitors converting on more top of funnel content. Be thoughtful with the resources you offer and consider why those particular resources are important to the overall lead nurturing process. While it is a best practice to remove the navigation on landing pages, after your visitor has already converted on something, so allow them to continue their journey. Whether it’s converting on the next form or searching through other informative pages on your site, each visitor should be allowed to create their own path. Ask your visitors to follow your company on social media and/or subscribe to your blog. Allow your visitors to engage with your content across multiple channels and keep in touch. Thank you pages are an easy way to improve your nurture strategy and make even top-performing content inspire more conversions and greater long-term engagement. Julian is a Growth Specialist for New Breed. He specializes in helping marketers meet their inbound marketing and demand generation goals.